Holiday Donations – Clients Packing for a Purpose! 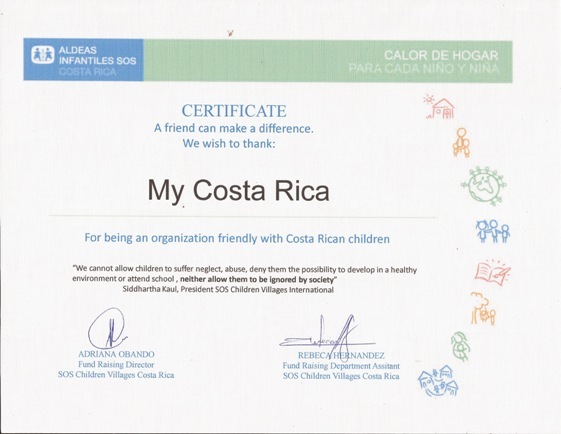 This holiday season My Costa Rica, in an effort to support sustainable and responsible tourism, began accepting charitable donations from our clients for a local orphanage. This initiative, part of the Pack for a Purpose program, gives our clients an opportunity to bring much needed school supplies, clothes, toys and other items to children in need. The response has been amazing and we are proud to say that in December and January we received 83 pounds (37.73 kilos) of charitable donations from our clients. The work began by picking a charitable organization that needed some help that we could support. We chose SOS Children’s Villages because of their longstanding reputation worldwide of working with orphaned children. This organization is committed to do whatever it takes to help their kids have the best possible childhood experience, but they are underfunded and need our help. It really is an incredible program, providing children who do not have parents to provide for them with a home and supportive environment. The children are supported by families within the organization, which help them experience love, learn about respect, and feel safe. These families as well as the entire organization help with the development of these children until they have enough confidence and stability to go off on their own. 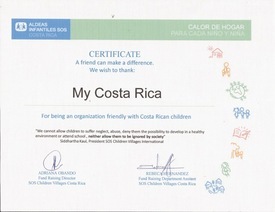 My Costa Rica is proud to make a monthly monetary donations to SOS Children’s Villages as well encouraging our clients to support this organization through the Pack for a Purpose program. 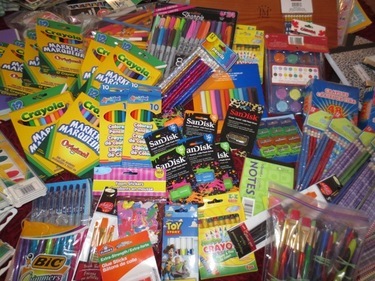 We received all types of donations and we wanted to mention specifically a few of our favorites. A few travelers, Kelly Buda and Drew Lederman among others, went out of their way and found us on-line and got in touch with us to drop off their donations. Our own client Joe Ratti arrived to Costa Rica with reading glasses, and Jeremy Waen donated soccer balls, as he helps with an amazing organization that donates soccer equipment all over the world! A representative from SOS Children’s Villages came to our office to pick up this impressive pile of markers, clothing, backpacks, sheets, towels, pens, kitchen utensils, you name it. All of this part of the Pack for a Purpose Initiative and thanks to the support of our clients! What an amazing impact our friends and clients have made on these children’s lives, and we are hoping for so much more! For a lot of us, it is hard to understand how much of an impact one small gesture can make. We see the results first hand here, and it is truly remarkable. To see first hand and to hear about the impact these donations are having on the lives of children in need is truly remarkable. 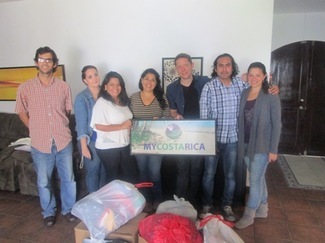 We again want to thank those of you who have donated, and encourage all of you still coming to Costa Rica to keep the donations coming! Again, Small Space. Little Effort. Big Impact.